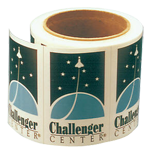 Quantities: 1000 minimum when custom labels are printed on press prior to numbering. Otherwise, 500 minimum unless there are several different labels the same size and specs. Consecutive Numbering Specs: Up to 9-digit numbers (i.e. 999999999). UPCs can be reduced or enlarged to fit practically any size.